2Can Pokie Review - Play today! 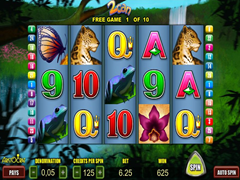 2Can was created on 5 reels with 25 paylines from Aristocrat Gaming and offers players a fantastic game that brings the wild from the jungle to your home screen. The sharp graphics and background sounds will bring the great outdoors, indoor with incredible winning opportunities. 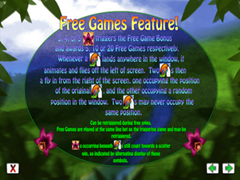 An amazing collection of features includes wilds, scatters, free spins and a bonus games. The 2Can jackpot offers 10.000 coins in the bonus rounds. Massive wagering options are available with the game. The pokie will let you choose the amount of lines you play from 1 to 25 and for those who choose to play a higher wager you can place an additional 5 coins per line, which will give you a maximum bet of 125 coins. Choose a value from $0.02 to $5.00 as the coin value and you will see the game can be played with all lines from $0.50 to $625.00. The jungle welcomes players with sharp designs that features the many wild animals that runs freely on the reels and eagerly groups into winning groupings. The background offers a beautiful waterfall with pink flowers on the river bed. 2Can is the brightest Toucan in this part of the jungle and he knows all the other animals. 2Cans friends are introduced by the colourful symbols including the super-fast tiger, brown monkey, colourful friend frog in purple and turquoise, chameleon with a colourful personality and the most beautiful butterfly, with the poker symbols offered in vibrant colours. The bird with the beautiful beak will complete the wilds. These are available on all 5 reels to complete combinations when possible. The symbols can be used anywhere to either extend combinations or to just act like one of the symbols to award you. The symbols advance a massive payout of 2,000 coins when you gather all 5 on a row. The pink flower displayed in a symbol will be the scatter that can be seen on all the reels after any spin. Only 2 will be required to gather multiplier rewards. The rewards from the symbols will be multiplied by the total wagered amount. Wild bird symbols cannot replace the flow to activate scatter rewards. Once you have gather more that 2 the multiplier reward will increase and a free spin game will be triggered. 5 to 20 free games are rewarded. When the wild bird symbol is shown in the feature it will fly off to the left of the reels, which means you will receive wild symbols that move off the screen per spin. Should another appear it will fly over to the right. The high valued symbols makes every winning spin worth your while on this colourful pokie. The great line up of features really adds some incredible additional wins to your credit line. The free spins is awesome and allows some relaxing time to sit back and watch the wins spin in.